One of the hardest jobs veterans have in Eastern North Carolina is – finding a job. 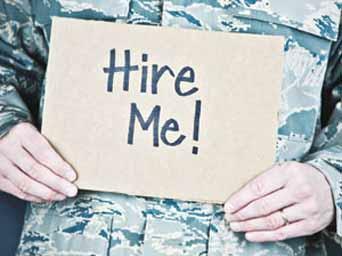 Hundreds of thousands of Veterans in the state still couldn’t find jobs in 2015, though the unemployment rate fell sharply from the previous year.Government and private sector initiatives have been established to solve the unemployment problem among the veteran population with some success. But as Chris Thomas reports, hiring men and women who served the nation in combat is still a hard sell. At the end of 2015, the unemployment rate for veterans in North Carolina was 3.2 percent. That puts the state among the top 10 states with the lowest unemployment rates, but prospects are still tough for veterans in this state and across the nation. Between 2014 and 2015, the unemployment rate among veterans dropped two, full, percentage points to 3.2 percent – lower than the national average. Sgt. Josh Villegas of the North Carolina National Guard. Sgt. Villegas works with the Guard’s Employment and Education Center’s office in Winterville. He‘s been there since its inception in 2014 and serves as a conduit between employers and soon-to-be civilians. In 2014, North Carolina’s veteran unemployment rate was at 5.2 percent – but still just under the national average. It put North Carolina in the bottom half among fellow states. Villegas, a former Marine, came back from his sole tour of Afghanistan in 2013 and remembers how difficult it was for some of his comrades to adjust to civilian life – especially infantrymen. Sgt. Villegas said he gets uneasy looks when he reaches out to employers in Pitt County and surrounding counties, asking them if they have room enough for veterans in their ranks. 2 years later, things are looking up for North Carolina veterans. Not only did the unemployment rate drop, but the number of veterans not engaged in the labor force dropped by about 7,000. According to federal statistics, jobs in manufacturing, professional and business service, and retail trade account for the lion’s share – 32.1 percent – of veteran employees. Sgt. Villegas says the bond shared by all combat veterans is unique and uses a terms more personal than “colleague” when describing his fellow veterans. In a way, Sgt. Villegas believes he’s in a family business. Sgt. Villegas says the Guard is just one of many organizations participating in North Carolina for Military Employment (or NC4ME), a partnership between federal, state, and private sector agencies and firms. According to statistics from NC4ME, the partnership’s efforts have led to 583 job offers for veterans and nearly 1,000 interviews between March 2015 and the end of the year. NC4ME’s most vocal advocate is Gov. Pat McCrory, and these days, it’s one of the few programs backed by his office receiving bipartisan support. Rob Schofield is policy director for the left-leaning think tank NC Policy Watch – an organization often critical of McCrory and his administration. Unemployment is an especially difficult problem in military-dependent areas of Eastern North Carolina. The North Carolina Department of Commerce reports 8 counties on or east of I-95 that have military bases – including Onslow, Craven, and Wayne – have unemployment rates over the state average. Mr. Schofield hopes NC4ME is the first of many such initiatives. It’s one thing to “Thank a Vet,” but it seems veterans desire, and deserve, something more. Like employment and the dignity that comes with it. If you’re a veteran who’s unemployed or underemployed, the North Carolina Department of Commerce, through their NC Works division, have a special section on their website and staff at several physical locations.